After being part of a group of Accountancy firms, the Directors wanted to move in a new direction and set up as their own independent company. After our initial insight phase, it became apparent that the Directors were focused on doing things different in their new firm, focusing on the relationships with their clients and building long term partnerships, not just providing an accounting service. We wanted to create a brand that stood out from the traditional firms, something which felt more approachable, and that really reflected the personalities and the passion of the people within the company, and their ambitions for the future. We chose the name Advance as we felt this reflected their energy and commitment to always going one step further for their clients, and the promise of the practice to help grow your business to meet your goals. The identity allowed us to create a recognisable marque with the A, something which can then be used throughout their communications. The company has now officially launched and the brand will be successfully implemented over the next three months. The People's History Museum wanted to create a campaign that encouraged the people of Manchester to become part of history and help to fund the important work that the museum does. The museum itself celebrates the stories of the radical thinkers whose big ideas have shaped our society. The Radicals campaign was about joining the heroes and heroines of the past with becoming a supporter of the museum today, to enable these important stories throughout history to continue to be told. The creative was designed to look home-made and featured different radicals throughout history as the campaign theme. The identity was applied to a range of materials both in and outside the museum, and included additional ideas to generate income through the gift shop and donation boxes. Big changes were afoot within universities nationwide. An increase in tuition fees meant going to university would become a more considered choice for students. The number of applicants were likely to reduce and universities inevitably had to work harder to secure admissions. Manchester Metropolitan University were looking for an agency to work on their 2012 undergraduate prospectus, the most effective recruitment tool for the university. They were in the middle of an aggressive development programme with millions of pounds being invested into new buildings, facilities and resources. We worked with their brand team to re-position the university as a serious choice for potential new students. Showcasing the huge investments in facilities, their great links with industry and creating a sense of excitement about studying with Manchester Metropolitan University helped set them apart from other institutions. The University maintained their level of applications whilst other universities in the UK were experiencing significant decline. Lancashire Encounter is an annual event which brings a range of arts and culture to Preston. The programme comprises of a weekend of diverse activities, from dance and music performances and large scale interactive projects, to smaller creative workshops and lessons. The new identity uses a distinctive shape which interacts with different themes and backgrounds to reflect the diversity of the event. The nature of the design means it can be refreshed and updated for each event, evolving each year like the programme it was created for. An explosion of colour was used as the backdrop to launch the brand, reflecting the vibrancy and variety of the events on offer. Womens Support Network and Jigsaw were two stand-alone charities dealing victims of sexual violence in the North East. The two organisations were due to merge and needed a new name for the brand, with an identity that appealed to both male and female audiences. Given the sensitive nature of the work the charities undertook, we needed to create a professional yet approachable feel that positioned them differently to other organisations in their field. The name Arch was developed with an accompanying softer design style, a calming colour palette and a reassuring tone of voice. The identity was applied across their literature, website and promotional items. The Corporate Games came to Preston in 2012. The council therefore needed a supporting campaign to raise awareness and generate interest around the event. The # device wasn't as widely used as it is today, and was introduced as a lead message in the campaign to allow us to use bold statements, create intrigue and encourage the people of Preston to find out more. The social media aspect of the campaign was to appeal to a younger, more media savvy audience, yet the message was simple and straight forward to allow it to appeal to the masses. We were asked to develop a new visual identity for a specialist division within Lees Solicitors, whose focus was on medical negligence. Rather than creating a completely new brand we built on the heritage and experience already established by Lees. We refreshed their existing logo and created a flexible device which could be implemented across the group. This was used to promote both this division and other specialist areas of the business, creating a more accessible creative style and tone. Following positive feedback from customer focus groups we developed the identity across their website and press advertising. Brooklands was a new development for Places for People. Rather than being just another regular housing development, Brooklands was about building a new community with a range of housing solutions and shared community spaces, all situated within lush green surroundings full of wild flowers and wildlife. The brief for this project was to showcase the type of lifestyle this development created. The identity was reflective of the development’s natural environment, which was applied across all the materials we produced. Imagery echoed shapes and scenes from nature, with natural sunlight bringing warmth to the creative. The identity was developed and rolled out across their website, marketing literature and sales office. People Power was a partnership between different councils throughout Lancashire. 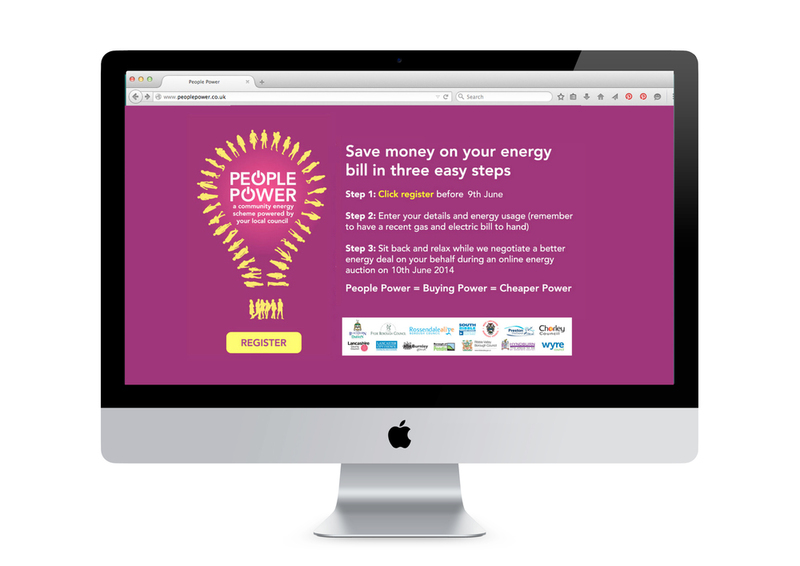 The aim of the campaign was to bring communities together to create bigger buying power and therefore a better deal financially with energy companies. After developing the brand we rolled this out over an online and outdoor campaign, which ran across the whole of the Lancashire region. Leading architect Simon Wallis had a string of impressive projects to his name, however his current branding and website really didn’t reflect this. When meeting Simon the passion for his projects was clear. Every project was completely different, and each one with an interesting story – but this detail and the passion Simon's had for each project was being lost on his current site. We talked through each and every project with Simon, along with the way he worked, then set about developing his brand. Keeping the existing logo we developed his brand to reflect the prestigious projects he’d worked on and create a new identity for the company that really reflected their capabilities. Using close up photography taken from the buildings he’s worked on and the detailed the plans he’s drawn up, these were applied across his current literature and website. Each project was then given it’s own space on the site to tell the full story, solution and also the end product. The content was written to highlight the unique process which Simon's has developed, and built his business on, along with the dedication and expertise that he brings along with this. The popularity of the Corporate Games put Preston under the spotlight and attracted visitors from around the world. This was an opportunity to showcase all that Preston had to offer, promoting the city as a great place to live, work and visit. Using the # device to tie in with the Corporate Games, a campaign was developed to highlight its appeal to a wide reaching audience. 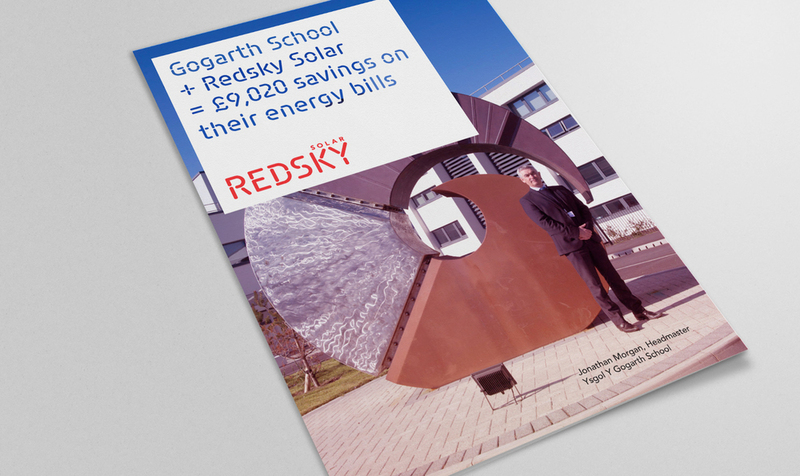 As part of the branding process for Redsky Solar we identified a need to educate future generations on the powers of renewable energy - beyond the financial benefits. We developed a separate campaign identity for schools with the aim of educating pupils on renewable energy and energy saving in general. The concept behind the identity was all about putting power in the hands of the pupils, enabling them to learn about renewable energy and run their own energy saving campaigns within school to educate their fellow pupils and future generations. The identity was developed across a number of materials including education packs for use within the schools. Architects Frank Whittle Partnership were launching a specific part of their business which focused on equestrian architecture. This was to be a stand-alone brand and needed a new identity to support it. We took inspiration from architects plans and used elements of these detailed drawings to create a simple but effective identity for their brand. Wedding photographer Victoria Franks approached us to create a new identity for her photography business; something that would complement the style of a modern wedding whilst retaining a traditional feel. The new identity was applied across all stationery and Victoria's website. Influenced by CityBrand's City Centre Walkaround Outdoor Museum, The Guild Trail is a self-guided walking tour exploring the places, people and events from Preston’s history; allowing those who take it to uncover interesting facts and unusual stories along the route. We worked with Treasure Trails Lancashire to create the tour along with Preston City Council as part of the Preston Guild 2012. Our brief was to develop an identity for a range printed materials that accompanied this particular trail.